4 Vanilla flavoured sponges filled with salted caramel sauce, topped with salted caramel and white chocolate frostings and a sugar confectionery. 4 Chocolate sponges filled with chocolate flavoured sauce, topped with chocolate flavoured frosting, a chocolate flake and sugar dusting. 4 Red velvet sponges filled with chocolate flavoured sauce, topped with vanilla flavoured frosting and a sugar sprinkle. 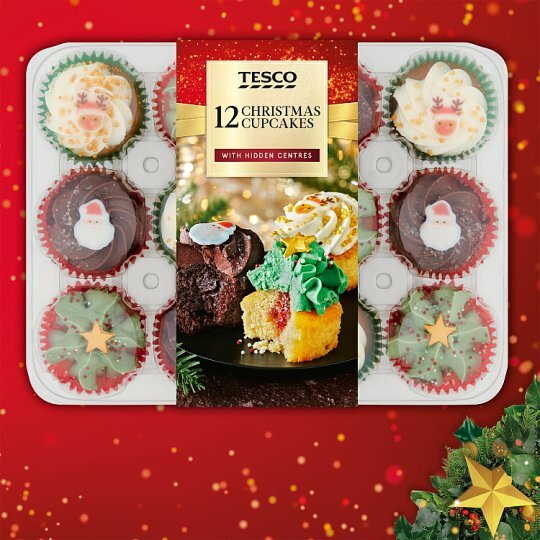 12 Assorted sponge cakes filled with sauce, topped with flavoured frostings and decorated. 4 Vanilla flavoured sponges filled with salted caramel sauce, topped with salted caramel and white chocolate frostings and a sugar confectionery. 4 Chocolate sponges filled with chocolate flavoured sauce, topped with chocolate flavoured frosting, a chocolate flake and sugar dusting. 4 Red velvet sponges filled with chocolate flavoured sauce, topped with vanilla flavoured frosting and a sugar sprinkle.